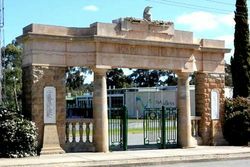 The Clare Oval Memorial Arch were erected in memory of those who died in service or were killed in action in World War One. 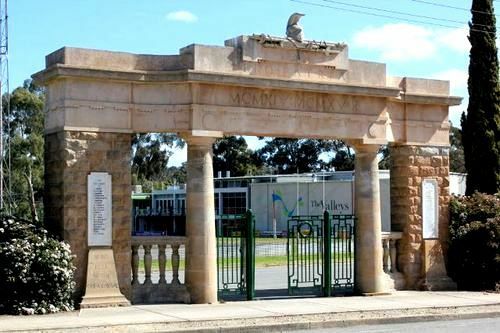 A soldiers memorial arch, which has been erected at Clare, will be unveiled by His Excellency the Governor to-day. The work is the result of the efforts of a committee composed of representative people of Clare, Hutt, and Hill River, who have built a suitable monument to the memory of men from those districts who fell in the war. Members of Parliament for the district will be present, and the viceregal party will consist of His Excellency the Governor and Lady Weigall, Major the Hon. Nigel Somerset, D.S.O., A.D.C., and Mrs. Somerset, and Dr. Williams. The Register (Adelaide), 6th April 1922.